Lisa Camilletti, right, dribbles around the perimeter during the Moffat County girls basketball game at Gunnison on Saturday. The girls won 54-26 and improved to 4-3 on the season. The Moffat County girls basketball team headed into its winter break on a high note. After a rousing victory against Olathe on Friday night, the Bulldogs followed it up with a 54-26 win against Gunnison High School on Saturday afternoon. Moffat County (4-3, 3-1 Western Slope League) beat a Cowboys team (0-6) which has had its fair share of struggles. Head Coach Matt Ray said it was a case of the Bulldogs being better across the board. The Bulldogs had to get into the game because they had dealt with a tough day of travel after getting on a bus at 5:45 a.m. to get to Gunnison after playing the previous night. As a result, they didn’t look as strong in the first quarter. At the end of the first frame, the score was 17-14 with Moffat County in the lead. Many of the Cowboys’ points came from Jordan Wallin, who finished with 21. But then Moffat County stepped up its defense and gave up 12 points during the remainder of the game, including winning the second quarter 18-2. “The first quarter, we had a little hangover,” Ray said. As a result of the big lead at halftime, Moffat County had the luxury of getting all its players on the court during the rout. Even better, every player except one scored a basket, giving a few players their first varsity points of the season. 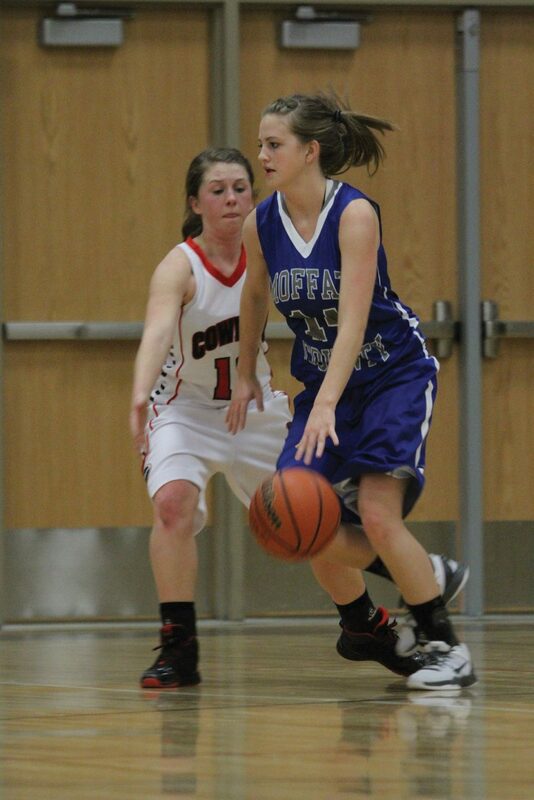 Kylee Ellgen again led the way for the Bulldogs with 10 points, following up her strong showing vs. Olathe. Leading scorer Lisa Camilletti added nine, and the Bulldogs had eight other players get into the scorebook with six or fewer. The win put Moffat County’s record over .500 for the first time this season, which Ray said was a nice feeling for a team looking to get on a roll and keep it going. The Bulldogs took time off for the holidays but will resume open gyms Friday followed by practices and a scrimmage against Meeker High School to get back into game shape before the season resumes.